The news on the internet has changed the way people get news. People now have plenty of choice when it comes to news and easily publish their news and opinions with a blog. One of the major innovations is the RSS reader which allows people to 'subscribe' to a website saving them time. As RSS usage become more widespread; the demand for mobile phone RSS readers will also increase. By working closely with RSS readers, Vodafone can capitalise on this demand. Finding news and information has changed quite a great deal with the rise of the Internet. There are several ways news is created and consumed on the internet. Traditional - From the traditional news companies such as CNN. Self-published - Personal publishing from the 'everyday user' and small groups via a blog. Primary - Produce their own information. For example the New York Times. Filter - Sorts news for you. For example, Google News. Social Media - Allows you to link to, vote, comment and discuss news articles. For example Reddit. Most news sites on the internet are a mix of primary, filter and social media sites. As an example, some of the more traditional sites like CNN now allow users to interact and submit their own photos and pictures and contribute. Other sites like Reddit do not produce their own news but link to and filter news and allow you to comment on news. One of the earliest examples of self publication on the internet is the blog or weblog. A blog is a website that has a journal like format and makes it easy for people to type and publish what they want on the internet. It is easy enough to start a blog simply register, choose a template and you can start posting immediately. Blogs are used by many people simply as an online journal or diary. However, a blog can also be used by organisations or people to publish news comments and opinions that are not published elsewhere. In the news industry, very often a journalist or columnist will report something in the newspaper and expand upon the report on a blog since there is no need to worry about word space. Other times, they might just give a report completely online. Just Another Mobile Phone blog - A blog that reviews mobile phones. Blog Basics - On what a blog is and how to blog. Guardian Unlimited Blogs - Guardian Unlimited's blog section collecting blogs of its journalists. One of the innovations that has arisen on the internet is the RSS news feed and the RSS reader. That's the RSS symbol which stands for 'Really Simple Syndication' or 'Rich Site Summary'. That icon gives people the ability to subscribe to a website. By clicking on the icon on a particular site or copying and pasting the link into your RSS reader you can 'subscribe' to that website. Whenever the website is updated, so is the information on your reader. To summarise, an RSS reader or 'Aggregator' is your own personal news page or computer program that receives the RSS updates to a website you subscribed to. If there any updates on the site, your RSS reader will be sent that information. 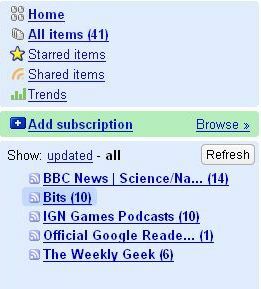 Google Reader - Google's web-based reader. Bloglines - Another popular web-based reader. Sage - A plug-in for Mozilla Firefox that turns Firefox into an RSS reader. Feeds that are new and unread are marked in bold. On the left side as shown below, there is a bar that filters my feeds according to website and I can subscribe to more websites if I choose. Isitebuilt - On benefits of RSS for your business. BBC - On RSS news feeds. Journalism.co.uk - On setting up an RSS. 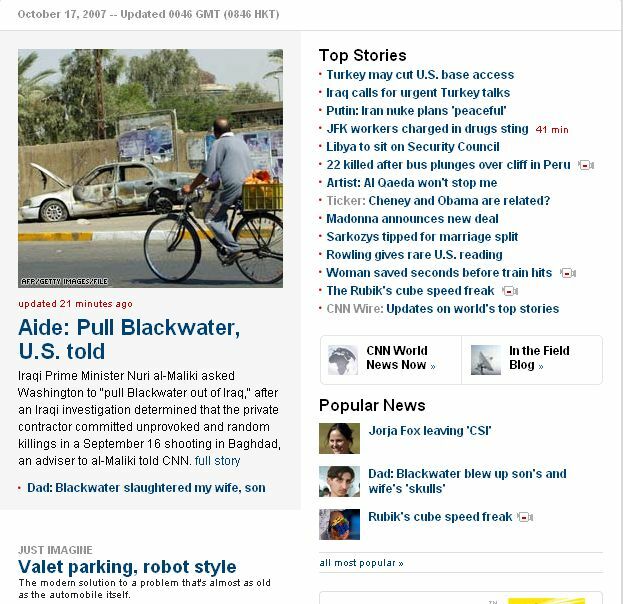 CNN's news site is very much a traditional producer of news information. It hires its own journalists and creates its own news. Google news is a good example of a filter website. Google news does not create its own news. Rather, it finds and provides links to existing news on the internet. Reddit is a good example of a social media website. Here users can submit, vote and discuss news. A similar site Digg was covered in more detail in the previous topic on social media. Reddit - A popular social media news site. CNET News - CNET's news page covering internet and technology. BBC - BBC's official website. CNN - CNN's official website. With the rise of the internet and the migration of news to the internet there has been a radical shift in news. News is no longer one day old but can be instantaneous. There is more choice than ever and people no longer limited by national or regional boundaries. Having a blog is an inexpensive way to provide news and comments. Furthermore, news is now interactive. Users can vote, leave comments and views on a news article or blog. The primary problem now is that there too much news. Users are now bombarded by too much information and a wide variety of choice. What we have then is the creation of news filters and social media websites to reduce searching time. In the future there will most likely be an increase in demand for filtering programs, increase in demand for RSS and increase in demand for interactivity. In the mobile phone arena, mobile RSS is currently gaining momentum. The technology of mobile RSS has actually been available since 2005 as seen from imedia connection and Yahoo!. Demand for mobile RSS has only recently picked up due to RSS itself not entering mainstream usage until very recently. One of the factors stopping mobile RSS from going mainstream is the lack of feeds properly optimised for mobile usage until very recently. Now that there is more demand for news and RSS while mobile, a variety of tools and companies have emerged to do just that. Litefeeds and Netomat HUB are two websites that allow you to subscribe to RSS and will automatically optimise the RSS for your mobile phone. In addition both allow you to upload to your blog from your mobile phone, share your posts with others and various other useful news related functions all from your mobile phone. This is currently what is being done, users can browse for free and Vodafone charges users a small fee to download a news article onto their mobile phone. Again, something that is already being done, websites such as Youtube and Blogger. With so many mobile phones already having photo and video capabilities, the demand for this will only increase. Users can also now subscribe to their favourite news sites currently for a small fee every week users can receive updates and news articles on their site. On the internet there are also a number of mobile RSS feeds so you can have RSS feeds delivered straight your mobile. For example, USA Today, Reuters and allow you to have feeds downloaded to your mobile phone. Mobile RSS is currently in the development stage. As it becomes more common, Vodafone should also ensure that their mobile phones are compatible with mobile RSS feed readers and possibly even partner with a feed reader company to make a Vodafone mobile even more attractive. As mentioned earlier, there will be a need for filtering programs to filter out information. With so much news online, giving users choice and the ability to filter out news on their mobile phone becomes important. Vodafone should not be tied down to only one news provider but have several choices targeting a variety of demographics. People can to easily share news with other people in their address book and through websites like Digg. With Vodafone providing access to Myspace and blogs Vodafone could also extend the same idea to these sites. From their mobile phone users can upload or share of news links from their mobile to their Myspace or blog. Tying a social media website concept like Digg into your mobile phone, Vodafone can give people the opportunity to vote and comment on articles via their mobile phone. This would be perfect for people who like to browse and do not really know what news might be of interest to them. Who are internet users paying attention to? With so many possible sources for news and opinions, it doesn't mean that everything that is published on the net will be read. Who are the bloggers or websites that people rely upon? Just because anyone can publish doesn't mean everyone will pay attention. What are people subscribing to? Like a magazine subscription, RSS feeds and user registrations give a reliable indicator of the success of the site. What websites therefore have a high RSS subscription rate and are constantly being checked? How can Vodafone increase interaction? The idea of interacting with news is still a fairly novel concept to many. How can Vodafone promote this interaction on the mobile phone? How can Vodafone improve news appearance? As mentioned earlier, news is often not formatted properly for mobiles. How can Vodafone improve this and increase news delivery? TMCNet Blog - Tom Keating on RSS feeds and mobile phones. On the internet, news comes from a variety of places. From the traditional news companies, organisations and even people themselves. There are three kinds of news websites on the internet, primary websites that produce their own news, filter websites that filter news by category and social media website that allow users to interact with the news. Most websites are a mixture of each of these types. A useful tool for people is the RSS reader which allows users to subscribe to their favourite internet websites. By providing access to news and the ability to share news via mobile, Vodafone can capitalise on the demand for news. In the future as RSS becomes more popular, so will the demand for mobile phone RSS readers. By cooperating with companies developing mobile RSS readers, Vodafone can be at forefront of mobile internet technology.